Located in the heart of Pensacola near the downtown area, Cordova Park is an older neighborhood consisting of affordable homes as well as luxury waterfront homes along the Texar Bayou. Although some were built in the 1960's, almost all the houses have been refurbished and well-maintained through the years. The streets are comfortable, with mature blooming trees and palms in the manicured yards of these elegant homes. The entrance to the community is off Summit Blvd, near Pensacola Bay. It is one of the largest communities in Pensacola, with over 1200 homes to be found in its borders. 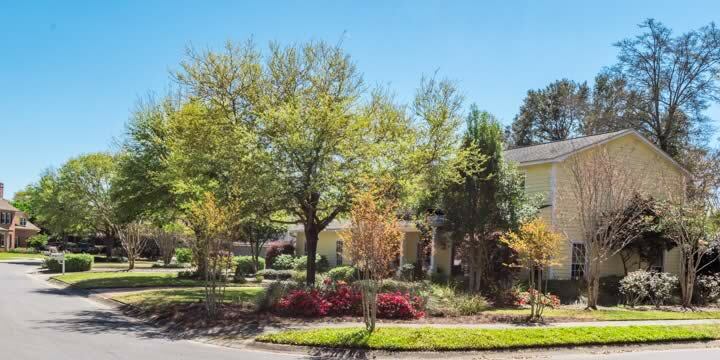 The many homes in Cordova Park are so varied that you will find something in almost every price range, from fixer-uppers to the lavish waterfront estates along Bayou Boulevard. Many are three-bedroom brick ranch-style houses, but you will also find four and five bedroom traditional homes with over-sized lots, and beautiful backyard pools. The homes along Bayou Blvd, in particular, are as breathtaking as any in Pensacola and offer every luxury. Prices range from $250,000 to a million dollars or more on the bayou. The community has four actual city parks inside its borders. Dunwody Park is in the center, with Miralla, Pintado, and Baars Parks situated in other parts of it. There are playgrounds, dog parks, trails, and sports areas to be had just a bike ride or stroll from your home in Cordova. The Bayou also offers nature lovers access to the Bay or water to see and enjoy. Like most of the neighborhoods here, you will have easy access to restaurants and attractions in Downtown Pensacola, as well as medical facilities and the airport nearby. Children in Cordova Park attend its own Cordova Elementary, which is one of the highest rated schools in the state. Other nearby schools include Workman Middle School and Booker T Washington High School. Cordova Park is a much-desired place to call home with an unbeatable location. Let Emerald Coast Realty show you why. Call to arrange a tour of the homes for sale in Cordova Park or any East Pensacola community.